Why Does The Google Pixelbook Have All That SSD Storage? As we took time to examine yesterday, there are many factors and motives concerning Google’s Pixelbook that we are still basically in the dark on. One of those unclear motives at this point is the inclusion of 3 SSDs that are FAR LARGER than any previously-installed SSD in a Chromebook. Up to this point, to my knowledge, we’ve never witnessed a Chrome OS device ship with any more than 64GB of storage. By that metric, a Chromebook that shipped with 128GB of SSD storage would be considered almost excessive in comparison. The Google Pixelbook STARTS at 128GB. This is the primary question, isn’t it? As a cloud-centric computing platform, Chromebooks don’t really need that much storage. Sure, 64GB gives users a good chunk of space to save pic, videos, etc. to their local drive without much thought. And adding Android Apps has only made that local storage a bit more precious. With larger games and apps that will live on your SSD, a bit more space is surely a welcome change to the current Chromebook storage situation. However, let’s consider something. ASUS, just yesterday, made the Chromebook Flip C101 available for pre-order. With a very reasonable starting price of $299, this brand-new device comes with only 16GB of storage. While I feel that is too small at this point, 32GB would have been plenty. The point being new Chromebooks are hitting the market right this very second and we aren’t seeing a random storage increase across the board. Other manufacturers aren’t, to this point, getting on board with ultra-large storage options for Chromebooks. 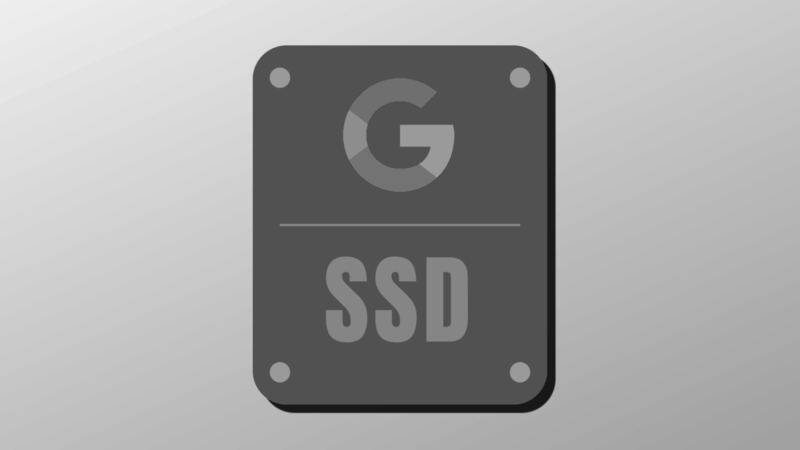 So, if we aren’t seeing anyone else hint at large SSD options, why is Google doing it? That much remains to be seen. But it ties into what I said in my article about the Pixelbook’s pricing. Regardless of what we know, there are still large pieces of info we simply don’t have at this point. Even without the ‘why?’ I think we can all agree Google is up to something, here. In the event that you aren’t a regular reader, subscriber, or commenter (we’d love for you to be all those things, BTW! Check the footer for all the ways to connect around here), I’d like to share a few of our reader’s thoughts on what this could all be about. Again, this is speculation, but it is fun to consider what Google could be up to with the inflated price, huge SSD options, and interesting naming of the Pixelbook. Oh speak for yourself. I want all the storage in the world. The storage bump actually does make sense considering the gazillion of Android apps folks will be installing now that it’s native to ChromeOS. Google is now seriously positioning ChromeOS as a direct competitor to its desktop counterparts. ChromeOS was way ahead of its time when it was first concepted. The world is not exactly ready for everything to be cloud-based just yet. So yeah, i welcome more local storage coming from someone that had a Dell CB 13 8gb/128gb until yesterday (sold). Saving up for that Pixelbook. Weren’t there some hints a while back about Android Studio possibly running on a Chromebook… some comments in code or a commit? If that were true for this device, it would definitely help justify the cost and the storage options. But maybe I am just too hopeful to have a justification to buy this! Again, there’s no wrong answer at this point. What Google is up to is anyone’s guess. Could be just as simple as a high-end Chromebook. It could be a whole new computing paradigm. We just won’t know until Google lets the cat out of the bag. We’ll obviously be talking a ton about the Pixelbook both before and after its official unveiling on October 4th. Stay tuned.